The crypto trading industry doesn't have much experience of margin trading, but it's something that traders demand. In the early 2000s, when online trading began its meteoric rise, FX was often sold as “decentralised” due to its over-the-counter nature. This apparently made it superior to the online stock trading venues that FX brokers were up against. It was a clever marketing trick, but it had nothing to do with decentralisation. Cut to 2017 and our marketing copy’s coming back to haunt us. In the shadow of the last financial crisis, a mysterious programmer invented a new type of decentralised digital asset, which spawned countless imitators and a handful of innovators, which also led to a completely new marketplace of online crypto exchanges, an ecosystem of peer-to-peer payments and a completely new breed of online trader. 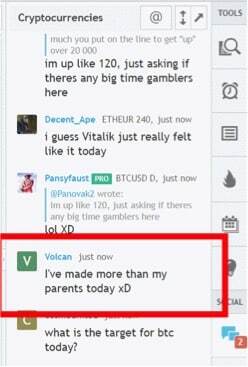 For a few years there, the old and new online trading industries existed side by side, for the most part ignorant of each other. Then, earlier this year cryptocurrencies finally exploded into the mainstream. Did it finally come of age? Did we all suddenly become believers? No, I don’t think so. What happened was that the incumbent online trading industry couldn’t afford to ignore cryptocurrency trading any longer. Why? Because cryptocurrencies started eating the world. Back in 2015, during the SNB black swan, if you were a top ten FX broker you probably handled up to a thousand support tickets per day. Kraken, an online cryptocurrency exchange, has been dealing with more than that on a daily basis since around April. In fact, between May and July of this year they handled over 180,000 of them. That’s what’s going on here, the number of new traders online crypto exchanges have on-boarded this year has been nothing short of staggering and CFD brokers are starting to feel it. So, what we have now is an industry in various stages of trying to pivot towards crypto, trying desperately to educate itself and comprehend where it stands in a world that’s suddenly had all the rules changed. Assuming that you know the basics about what cryptocurrencies are and how they work, the first thing we need to address is that our industry’s main innovation is a derivative called a CFD. This allows anything with a price feed to be traded, without ever taking possession of the underlying. This is fundamentally at odds with crypto’s central innovation, the blockchain, which allows you to actually take possession of the digital assets you’re trading. If you’ve ever had the experience of purchasing cryptocurrencies and moving them between exchanges in a matter of minutes, you understand the freedom that crypto affords traders. So, our industry’s tried and tested marketing strategy of ignoring the derivative nature of its assets can’t continue in this new landscape. The slogan “Trade Bitcoin” comes with certain assumptions that the slogan “Trade EURUSD” or “Trade Gold” never did. How many CFD traders actually want to take possession of the currencies or the precious metals they trade? Not so for crypto traders, who do want to hold their own coins. In fact, it’s built into the very logic of decentralisation that every individual can and should easily and securely control their own digital assets, thanks to public key cryptography. In my opinion, the fact that we trade in derivatives isn’t a weakness at all. Margin trading is precisely our main strength and CFDs are the product we should be selling here. Someone ought to point out that exchanges and brokerages are not the same thing. Most cryptocurrency trading is done on online exchanges, where the available liquidity comes from all the parties trading on that exchange. If you put in a limit order you see it pop up on the order book, if you buy or sell at market you see the liquidity you took disappearing. A brokerage, on the other hand is a venue where you trade on margin, “buying” and “selling” directly from the broker, who manages the spread. These are two different types of business that work in different ways. Why am I stating the obvious? 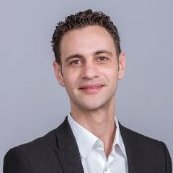 Because many crypto exchanges are now also attempting to play the role of broker, without their customers fully understanding the difference. Your average crypto trader doesn’t realise that they’re dealing with a completely different arm of the business when opting to press that “margin trading” tab on Poloniex, or when changing the contents of that “leverage” box on Kraken. If you’ve ever tried to short on margin on one of these exchanges, you’ll know what I’m getting at. As quick and free and transparent as crypto trading can be when you hold the underlying, it’s a totally different experience trying to trade it on margin. It’s buggy, it lags, you often don’t get filled, or get filled at a worse price, especially when your trade is a no-brainer and you’re leveraged-up. Consequently, it often feels like you’re being ripped-off. In short, margin trading on crypto exchanges feels like our industry did 15-20 years ago. The crypto trading industry doesn’t have much experience of margin trading, but it’s something that traders demand. Margin trading is currently our domain, from the inherent conflicts of interest, to the differing business models that attempt to mitigate these conflicts and all the regulatory hurdles involved in offering these services in as accountable a manner as possible. This is a process that our industry has already undergone. What we have here is an opportunity to consolidate a vital share of the crypto market, adding much needed liquidity to this space in the process. If you listen to any of the pundits from the institutional space discussing bitcoin back in 2014, their main concerns were always not enough liquidity and the absence of reliable derivatives markets that would allow for diverse access to this new asset class. This is precisely what we should be offering to retail traders, especially since leveraged trading is our forte and we have become very adept over the years at managing the risk. Why do you think that Japan making bitcoin legal tender is such big news? It’s not because Japanese citizens are all about to start buying groceries with bitcoin. It’s because Japan boasts the largest and most advanced retail trading industry in the world, and it just got a hell of a lot bigger thanks to crypto. User experience is another area where our industry has a notable advantage. The competition in the online CFD space over the past decade or so has led to a great deal of innovation in trading interfaces and the ways in which they integrate to the back-end systems of brokers. This is something our industry needs to leverage in this great crypto shake-up. From a UX perspective, almost all online crypto exchanges are lagging behind. Crypto traders are generally stuck using the order book from a web page, manually trading into the bid/ask when entering positions at market and with very basic charts/analysis tools to support them in their decision-making. It’s also no news to crypto traders that many exchanges are struggling to handle the volume of traders they have recently on-boarded, making trading at certain times an intolerable experience. Recently, Kraken actually reduced price precision on a large number of pairs, removed a bunch of others altogether and temporarily suspended advanced order types. On the other hand, the obsession of CFD brokerages with algorithmic trading in the early 2010’s led many of them to enter an arms race for greater transactions per second. 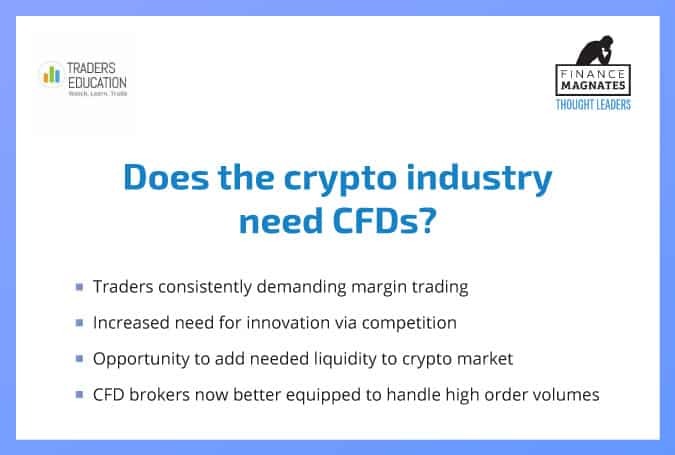 An interesting consequence of this is that CFD brokers are now much better-equipped to handle high order volumes without detriment to the experience of their traders. To recap: there is no need to pivot. We have expertise in an instrument that the crypto trading industry needs in order to grow. Our platforms are easier to use and more sophisticated, our trading infrastructures are set up to handle a greater volume of orders without detriment to the experience of end users. We have been navigating the regulatory landscape for a lot longer and are experienced in dealing with the conflicts inherent to margin trading. In short, we’re exactly where we need to be. I look forward to discussing the issues raised in this article at a workshop I’ll be hosting by the same name at this years London Summit next month. See you all there.